Chemical storage presents hazards and risks that can be mitigated through safe practices. A chemical storage facility from U.S. Chemical Storage creates a safe environment in which to store your chemicals, protecting you, your personnel, and your community. A chemical storage facility should be designed to prevent environmental hazards, and that’s what U.S. Chemical Storage has achieved with our custom buildings. Your chemical storage facility will be engineered with quality materials by professionals dedicated to helping you maintain a safe environment. With so many risks, there is no room for mistakes, and we are committed to bringing you a quality product with unbeatable service. There is a great amount of consideration and planning that goes into compliant storage techniques. Your compliant storage process can be streamlined with efficiency and protection with our chemical storage facility. Designed to minimize hazards, a chemical storage facility from U.S. Chemical Storage is the perfect way to achieve compliance with federal, state, and local regulations. Our endless line of custom accessories further enhances safety by providing you the means to comply with regulations for any number of chemicals. 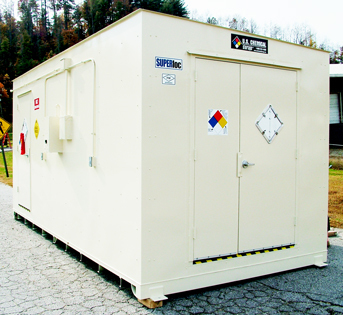 U.S. Chemical Storage has brought you safe, compliant storage buildings since our founding in 1983. We have long been dedicated to chemical storage safety, keeping up with evolving technologies and standards to design and build a chemical storage facility that outshines all others in performance, durability, reliability, and safety.